Having started filming the documentary Delicious Peace Grows in a Ugandan Coffee Bean back in 2006, the JEMGLO production team was excited to see The New York Times today refer to the cooperative of Christian, Jewish and Muslim coffee farmers who comprise the documentary subject. The principals of JEMGLO, producer/writer Ellen Friedland director/DP/cinematographer Curt Fissel, are also the principals of Voices and Visions. Highlighted in the Food section, the Times noted that “J.J. Keki, a Jewish Ugandan coffee farmer…enlisted Christian, Jewish and Muslim farmers to form a coffee cooperative. The result: Delicious Peace Coffee (Mirembe Kawomera), which comes in a nutty-tasting light roast, a rich dark roast and decaffeinated.” The Times’ mention coincided with the launch of a Smithsonian Folkways recording on CD produced by Rabbi Jeffrey Summit of 16 songs by the farmers titled Delicious Peace: Coffee, Music and Interfaith Harmony in Uganda. The first version of the documentary, narrated by actor Ed O’Neill, was released in 2010 and screened at over 35 film festivals internationally, including many prestigious festivals, and won a number of meaningful awards. This past March Ellen, Curt and several additional members of a production team, returned for a fifth trip to the cooperative to videotape updates (link to the blog), including a qualitatively improved standard of living thanks in large measure to Fair Trade wages paid to the farmers by their coffee buying partner, Thanksgiving Coffee Company. The documentary is available to educational institutions through the Video Project. 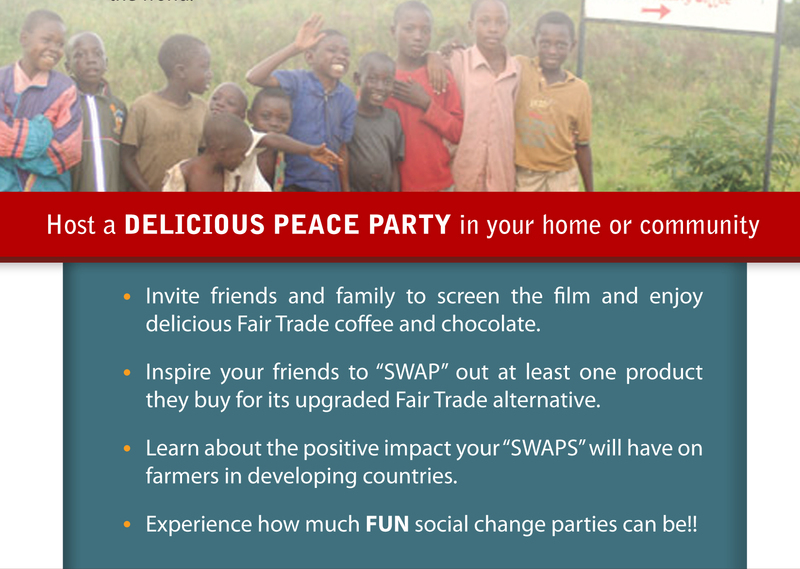 In addition, socially-conscious media company Specialty Studios is distributing Delicious Peace Grows in a Ugandan Coffee Bean by organizing Delicious Peace Parties where the film is screened and Fair Trade coffee and chocolate are enjoyed. Please contact them for more information! This entry was posted on June 5, 2013 at 4:09 pm and is filed under Business Video, Corporate Video Production, delicious peace coffee, Documentaries, Enjoy Your Coffee, Marketing Video, Nonprofit video. You can follow any responses to this entry through the RSS 2.0 feed. You can leave a response, or trackback from your own site.